Gila Monster Word Game – What is the Gila monster? Download this fun FREE Science printable word search activity sheet for kids to learn fun facts all about the Gila monsters. This fun science for kids worksheet includes a word search game as well as a hidden and missing words puzzle for kids. It is free to download and free to print and use. This fun science activity sheet is ideal for kids in Preschool, Kindergarten as well as Grammar & Primary school in Grades One to Five. Primary school kids can use our fun word search puzzle as a reading comprehension worksheet while learning fun Gila monsters facts. Younger kids in Preschool & Kindergarten who cannot read and write can use the Gila monster words game as a listening comprehension activity sheet. Educators and teachers can use our fun FREE science printable activity sheets to supplement science classes, for after school enrichment programs and as early learning science activities. Parents homeschooling their children can use our Gila monster word game activity sheet as a fun learning tool to gain their kids interest in science. EASYscienceForKids.com is a great parent resource for free printable easy science activity sheets, printable word search games for kids and easy science word seek puzzles. What are Gila monsters? The Gila monster is the largest lizard in America. Gila monster lizards live in the desert because they love the heat. They can grow 2 feet long, but they only weigh about 5 pounds. Gila monsters can live up to 30 years. Learn more fun facts about Gila monster lizards by downloading the fun science word search game activity sheet! [sociallocker]Download the word search activity sheet about the Gila monsters. Download the FREE Gila Monster Word Game Activity Sheet! Did you enjoy the Gila Monster Word Game? Read lengthy information all about Gila monsters here. Declan, Tobin. " 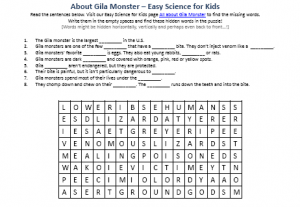 Gila Monster Word Game - Free Science Printable Word Search Activity Sheet - ." Easy Science for Kids, Apr 2019. Web. 21 Apr 2019. < https://easyscienceforkids.com/gila-monster-word-game-free-science-printable-word-search-activity-sheet/ >.